People love Scotch eggs. People also love meat pasties. 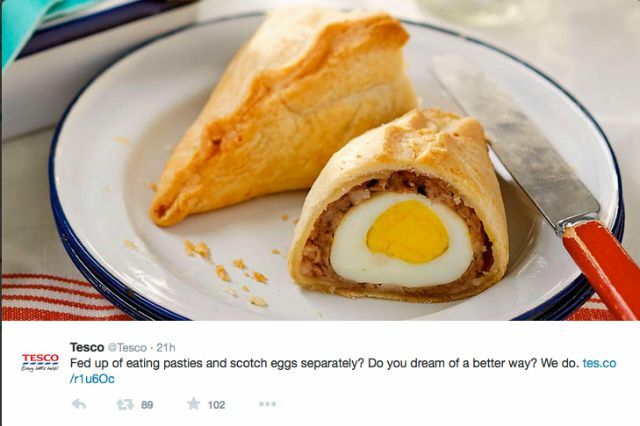 So when Tesco blended the two together in an experimental Scotch-egg-come-pasty extravaganza and posted it on Twitter, it was probably waiting to sit back and lap up universal applause form appreciative customers. However, Twitter's reaction was quite the contrary. Rather than applauding the invention, people got very, very angry. Some just didn't appreciate the fusion of two perfectly good snacks. It's just not natural. @Tesco first Dolly the sheep...now this. If you actually think the pascotchy looks quite yummy, you can make your own with Tesco's recipe here. In September 13-year-old Robyn Hills from Wellingborough in Northamptonshire, had a horrible shock when she took a sneaky swig from a 2ltr bottle of Lidl cola. Something weird and rubbery touched her lip, and when she peered into the bottle she was sure she could see a human finger. In the end it turned out to be a shredded surgical glove. It's less stomach-churning, but it still isn't a brilliant addition to a bottle of coke. This summer it was the turn of Manminber Singh, a 37 year-old burger fan, who fancied a chicken burger at Burger King in Darlington in County Durham. He fancied it a great deal less after taking his first bite - when he came face to face with a slug. Around the same time, the former owner of Munchies takeaway in Leeds was ordered to pay a court £2,000, after a customer found a cockroach baked into the crust of a pizza bought there. The restaurant was closed down and ordered to clean up, and is now under new management. A couple of months earlier, Jenna Murray, a 29-year-old model from Camden in North London had a face-to-face encounter with a critter in her dinner. She was tucking into a 'Delicious and Nutritious' smoked mackerel, new potatoes and beetroot dish from Marks & Spencer when she came across a one-inch-long dead beetle. Sometimes you have to look a little closer: in October Hayley O'Shea, a 39-year-old accountant from Bournemouth in Dorset, was cooking dinner for her daughters when she noticed something odd about the pasta. She had opened a new packet and poured the pasta into the saucepan when she spotted hundreds of tiny black things. She drained the pasta, took a closer look, and discovered it had been crawling with weevils. Creepy crawlies aren't the only thing to watch out for either. In September last year Katie Crabtree, a 31-year-old mother-of-two from Stockport, bit into a dead, sliced, rodent tucked into a Tesco sandwich. It was lurking in a BLT sandwich and she mistook it for a bit of burned bacon. It was only on closer inspection that she spotted the fur. It's not just creatures lurking within food either. This February, Marie Doyle, a 24-year-old from Sittingbourne in Kent, was unwrapping a pre-cooked chicken for her Sunday dinner when she discovered something that made her stomach turn: there was a blue plaster stuck to the chicken. That same month Tony Hinds and his fiancee Lauren Gooch found something even more grim in their packet of Tesco Finest Pork and Chive sausages: a human tooth complete with filling. Tesco said in a statement that it was confident that the tooth was not in the sausage when it arrived in the store, as the supplier used metal detectors on everything leaving the factory - which would have been set off by the tooth. One really odd find came to light as a man was prosecuted for tampering with food on the shelf of a branch of Tesco. A drug addict had been trying to hide his addiction and find somewhere to hide a bloodied syringe in the store. He pushed it through the wrapper of a loaf of bread. It was found by a mother, whose 2-year-old daughter was already tucking into a sandwich from the loaf. But possibly the most well-known weird thing found in food in the UK was the mouse found in September 2010, baked into a loaf of bread, of which several slices had already been used. This hit the headlines because it is one of the very few instances where the shopper received compensation - after the case was heard by Oxford Crown Court.